My friend G amuses me. We were out for dinner in Singapore and throughout the day he was quite conscious of avoiding meat as it was a Lenten Friday; a day of abstinence for guilty Filipino Catholics. He was really worried; not thinking about how even more decadent our seafood binges were. I, for one, don’t really find abstinence difficult as I’m not the type of person who has to have meat at every meal. And, really now, I don’t think putting bacon on everything necessarily makes things taste better. It’s pretty difficult to be a 40-day vegan or even pesco-vegetarian in Manila as restaurant menu options are a bit limited. But in Singapore, it’s a little easier to get a satisfying non-meat meal. After another massive seafood dinner in local favorite Por Kee Eating House (consisting of razor clams, a whole snake head fish soup, prawns vermicelli and shrimp hofun) we find ourselves walking (or waddling) a few blocks down to Yong Siak Street. It was a quiet neighborhood; hip and dotted with independent galleries and coffee shops. And towards the end was this place too interesting to pass up. We had actually walked several blocks past it, but decided to come back for a drink. It was about 10PM yet the place was still packed. So we were seated at the bar, which was quite cool as there was a good view of the open kitchen action and the coffee station (where the Filipino baristas were showing off their espresso crema art to us). 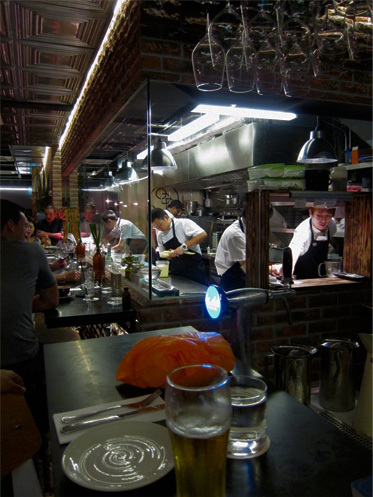 The place was called Open Door Policy; a reliable friend informed me of this place before coming over to Singapore. It’s run by Ryan Clift, chef of the modernist Tippling Club, along with the owners of the quaint yet renowned coffee shop across the street called Forty Hands Cafe. And while the Tippling Club will definitely bore a sizeable hole in your wallet — a tasting menu could easily be around S$400 per person — Open Door Policy decidedly goes for thoughtful, well executed food at more democratic prices. We were quite intrigued by the menu that, however full we were, we couldn’t help but order a couple of their starters to go along with our drinks. So along with G’s Asahi draft and my glass of Grüner Veltliner we had requested for the Four Bean Sourdough Bruschetta with Mint Dressing and the Halloumi Cheese with Olives, White Anchovies and Crusty Bread. Still meat free choices if you notice. The dishes were quite huge. 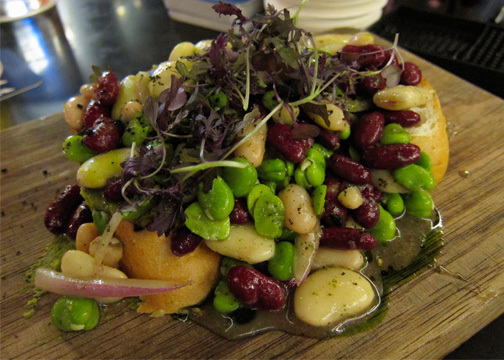 The four bean bruschetta arrived piled on a wooden board. It was a great play of creamy, nutty, sweet and meaty from the combination of white beans, edamame, kidney beans and peas. Drizzled on top was some excellent olive oil along with a mint infused dressing. I was expecting the bread to be a bit more crunchy and grilled as with a regular bruschetta, but nonetheless the whole dish worked as a whole. The halloumi cheese plate was delicious in its simplicity. 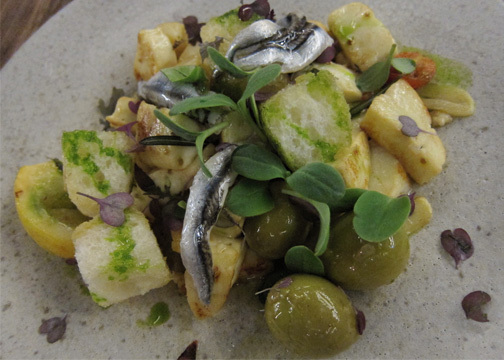 Generous chunks of warm cheese was topped with these huge green olives, cubes of soft bread and vinegared anchovies (boquerones en vinagre). Halloumi is actually a very firm, rubbery cheese that holds itself well against heat. You can actually grill it and it won’t really dribble through the grates. Slices of these are pan fried in olive oil and served in many Greek restaurants. But here you get it without the obnoxious shouts of “Opa!”. It’s mildly salty, in fact the olives provide much of the salinity of the dish; and the anchovies provide that sharp, tart counterpoint for the richness. The kitchen eventually closed soon after our orders arrived. And while I can’t base my impression of this restaurant on two appetizers alone, I must say we had a good enough time and it has piqued my interest enough to make me want to come back, hopefully in a few weeks. When its not Lent and nobody will feel guilty ordering the braised beef cheek. Cooked for 48 hours. Where's the bread, Paul? Was it underneath the hill o'beans? Ha. Yes, you can actually see the crusts peeking at the sides, bottom layer.